ST. JOHN’S, Antigua (June 18, 2018) — What do you get when a national hero of Antigua and Barbuda and international cricket legend hails your team of female rowers as heroes? 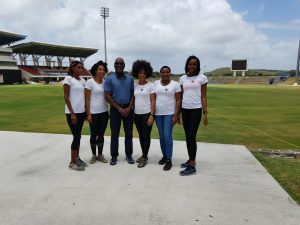 That’s how Team Antigua Island Girls felt on Monday following a noontime meeting with Sir Viv at the stadium in North Sound Antigua that bears his name. Team Antigua Island Girls will represent Antigua and Barbuda in the 2018 Talisker Whisky Atlantic Challenge. The third team to represent the country, they will be the first all-woman team from the Caribbean, the first all-black team in the event and the first all-black team to row across the Atlantic. The challenge will take the them 3,000 miles from La Gomera to Nelson’s Dockyard in English Harbour, Antigua. The women have set their sights on breaking the record in the Women’s Division, which is 34 days. Each team participating in the event rows for a cause, and Team Antigua Island Girls has selected the non-profit Cottage of Hope, a residential home for girls who have been abused, neglected or orphaned. The team is presently raising funds to get to the starting line. The operational cost is US $150,000.00 and does not include money for the charity. The race begins on December 11, 2018. The team must arrive in La Gomera at least two weeks earlier. The window to raise funds is small, with a series of stacked deadlines for the various components of the initiative.